Earlier this week, I was forwarded the following video from SunTV. In it, Ezra Levant interviews self-confessed Greenpeace dropout Patrick Moore about a supposed controversy over a very common chemical: vinyl. I think it’s fair to say that few people tune into SunTV expecting to see rigorous, in-depth science journalism. Like their American counterparts at Fox News, the producers at SunTV seem more interested in stirring up controversy than providing a nuanced view of complex issues. Weirdly, this interview seems to be a propos of nothing, as I can’t recall a recent news story that focused heavily on vinyl in any way. But to be fair, Patrick Moore doesn’t say anything about chlorine that isn’t technically true. So why am I writing about it? Because in trying to defend vinyl, Moore is using exactly the same tactics that he deplores unnamed environmental groups for using. And regardless of who’s using them, these tactics confuse the public’s understanding of science, which is something I care deeply about. So let’s set the record straight: chlorine is indeed perfectly innocuous in certain forms, like table salt. Chlorine is also extremely toxic in other forms, like mustard gas. To argue (as Moore appears to do) that chlorine is part of beneficial substances and therefore all chlorine = good is just as nonsensical as arguing (as he claims the environmentalists do) that chlorine is part of toxic substances, and therefore all chlorine = bad. Like all elements, chlorine has no inherent morality: it just is. Its capacity to cause harm or lack thereof depends on what it is combined with. 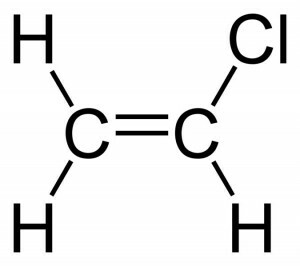 As for the substance we call ‘vinyl’, it is actually a long-chain polymer called polyvinyl chloride (PVC) which is made up of thousands of units of the monomer vinyl chloride, pictured at left. Vinyl chloride is quite toxic in its gaseous form, causing liver damage and cancer. But when reacted to form long chains of PVC it becomes completely inert and harmless enough to make into drinking water pipes, credit cards, and LP records. Environmental concerns over PVC stem not from the material itself, but what else might be in it. 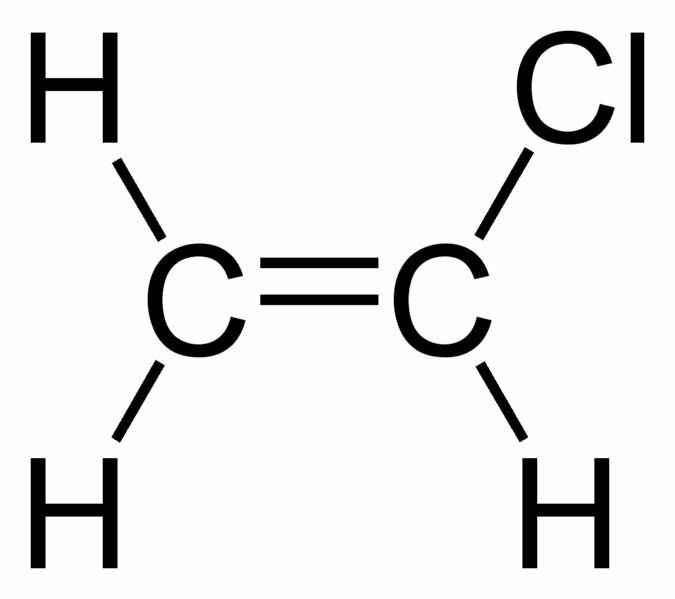 Some environmentalists worry that unreacted vinyl chloride might remain in the finished product, but modern chemical processing techniques have virtually eliminated this problem. However, PVC is routinely mixed with additives to change its flexibility, colour, heat tolerance, and any number of other properties. These additives vary so widely in type, composition, associated hazards and amount used that it’s hard to say anything conclusive about them. It’s true that some of these additives may pose some risk, the question is whether or not they are released in sufficient quantities to cause harm to humans or the environment, either during normal use or when PVC is incinerated at the end of its lifetime. PVC can be recycled, but this can be difficult depending on what additives are in it. Incineration is often the most cost-effective option, and it’s at this point that the chlorine in the product may or may not recombine into other, less innocuous forms. This is where the debate rages on, and I won’t comment on it further except to say that many science-based regulations are in place and are constantly being reviewed to ensure that PVC products pose minimal danger, either during their lifetime or afterward. No product is completely without risk, and there are many hazards that we willingly accept every day, from taking a ride in a car to eating street meat, that strike me as more worthy of our concern. I’m not saying we shouldn’t debate the merits of PVC, but when that debate degenerates into meaningless comments about the nature of chlorine, it misses the point and serves no-one. Great commentary, Tyler. PVC pipes are a product that I specify in contract packages continually throughout Ontario and have constant debates with both technical and common folk regarding it’s environmental impacts. Inevitably, we always end up at “it’s not perfect, but no product is risk-free” as you mention here. HDPE is another product being used more and more in my field, wondering if you have any insight/information I could use to discuss? Thanks for taking the time to read this and commenting! High-density polyethylene (HDPE) is often considered safer than PVC because it’s only made of hydrogen and carbon, so there’s no potential for the chlorine to re-combine during incineration. But just like PVC, HDPE is often treated with a wide variety of additives to alter colour, heat tolerance, rigidity, etc. This puts us in the same position as for PVC, i.e. it’s hard to say exactly what’s in it, so we can’t be 100% sure of what will happen if it is incinerated. But I should point out that modern incinerators contain scrubbers that can capture many harmful compounds for safe disposal, regardless of what plastic you’re throwing in it. Essentially, we need to weigh the risks of polymers against the benefits, of which there are many. Just today I had two teeth filled with polymer-based dental composites, without which I might have developed painful cavities. I’d also rather have a pipe made of HDPE or PVC than one made of lead. In general, I think that we know enough about chemistry to be able to use polymers and dispose of them at the end of their life in a safe manner, if we put our minds to it. It’s not perfect, but the danger posed to human health pales next to other risks people routinely assume, from smoking to water sports.